For the last seven weeks, I have been given the gift of a Sabbatical from my vocation as an associate rector in the Parish I serve. I say "gift" because that is exactly what this time has been, and it is the truest meaning of Sabbath I know. Many people I've encountered are familiar with an academic sense of Sabbatical--one goes away to deepen their study of a particular subject. Many universities grant a full semester for Sabbatical. The Church (at least in some traditions) also grants Sabbatical leave; many clergy apply for and receive a grant with the average time of leave being approximately three months. My Sabbatical did not fit the norm; while I did go away on several small trips, I mostly enjoyed being home for most of the seven weeks of leave from my vocation as an associate priest. The time away provided me with what I needed most--rest. I chose a theme (but did not have a grant or 3 months) of Reconnect. My goals were to reconnect with God, and I chose as my symbol the Labyrinith. 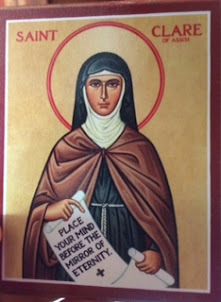 As a Third Order Franciscan, I wanted to also reconnect with my Community--I began both of these goals in San Francisco with the Community of St. Francis. While in San Francisco, I also visited Grace Cathedral where I spent time walking their labyriniths--the center serving as a deep symbol of my reconnecting with God. And then there was the goal of reconnecting with family and friends. Blessed, blessed, blessed time with my spouse! The joy of being at our little homestead was indeed balm for my soul. Time spent reconnecting with my daughter, too; a way of being present for her that isn't always possible when I am working. My husband and I made a few trips to see friends we've not seen in years--picking up where we last left off in conversations and friendship! Such delight! There have been books read, meals cooked, music heard & played, sewing and knitting and new friends in our lives during these seven weeks, too. While there have been no great revelations on this seven week Sabbatical, I can say there have been some great learning! I believe I understand the deeper nature of Sabbath--the Biblical interpretation. I learned in seminary that Sabbath keeping meant reading Torah and making love to your spouse! But I expand that notion: it is about reconnecting with God and nurturing relationships! I truly believe God intends for us to claim the gift of Sabbath weekly; indeed it is one of God's commandments--to remember and to keep it holy. Holy is appreciating the gift in our midst. So what have I learned this Sabbatical? I've learned that Less is More, Bigger doesn't always mean Better, the word "NO" is not at dirty word, practicing detachment is hard (caring and prayer don't take a Sabbatical! ), to nurture my introverted side (I could have been a monastic! ), home cooking is best, I am decidedly a Christian, I love being home, and yes, I love making this homestead life with my husband of almost 38 years! And, I think we've decided on a name for this little place: Our little piece of Paradise Homestead! 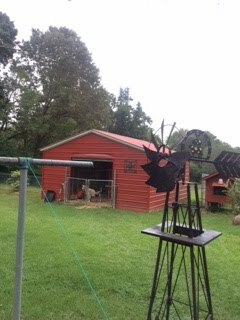 It seems to be coming together, with our goats, the backyard Labyrinth we're completing, the dreaming of chickens in the spring, and so on. We celebrated a home communion here on Christ the King Sunday; I made the bread and we gathered with our critters for a memorable time.Something special about having church at home once in a while. Thank you Shepherd's Hill for such inspiration! I return to my Parish Family tomorrow, rested and hungry to be back in community. We'll gather with our children for a celebration of the REAL St. Nicholas--the one who points the way to Jesus! It's the perfect ending....or beginning...with memories I'll savor for days to come!